Wholesaler giant saved an estimated 90 percent on costs and several days of downtime by choosing a heavy-duty duplex grinder from Saniflo to solve its plumbing backup issues at a branch in Raleigh. When Ferguson — the largest U.S. distributor of plumbing supplies, PVF, waterworks and fire and fabrication products — encountered extensive plumbing-system backups at one of its branches, it decided to trust one of the product lines they offer to customers, Saniflo grinder pumps, as the most practical, cost-effective solution. Ferguson in Raleigh, N.C., had been experiencing a gradual worsening of the backup problem. As a result, Branch Manager Nathan Smith called certified plumber Dale Nichols of PipeTechs Plumbing Technologies, which offers rapid-response plumbing service to Raleigh and the surrounding areas. After assessing the situation, Nichols, a 30-year plumbing industry veteran, presented two solutions to Smith. The first was financially unrealistic, in that it would have involved tearing up the building’s entire foundation to install a proper piping slope across 200 feet. The costs would have been astronomical. Smith was referring to Saniflo plumbing systems, which can macerate, grind and/or pump both wastewater and solids from multiple fixtures to a drain line. Nichols ended up recommending the Sanicubic 2 duplex grinder system. Designed for heavy-duty commercial applications, the unit is equipped with two grinder pumps for handling multiple waste fixtures. This, as well as its ability to effectively grind tightly woven sanitary articles, such as feminine products, baby wipes and dental floss, were the deciding factors. “I use this product in my own shop because its heavy-duty capabilities offer peace of mind that it won’t clog. The simple controls, connections and accessibility make it a very desirable product for me to install, and my customers to use,” says Nichols. The two grinder pumps are also designed to operate alternately, so that neither is more heavily used over time than the other. However, if either ceases to operate, the other will run full-time until servicing can eliminate the problem. The pumps are also “smart” in that both do not operate simultaneously unless the rate of incoming water is high enough, in which case one signals the other to turn on. When both pumps are in operation, the discharge rate increases roughly 80 percent. Nichols installed the pump to handle wastewater from two bathrooms and a kitchen sink at the showroom. 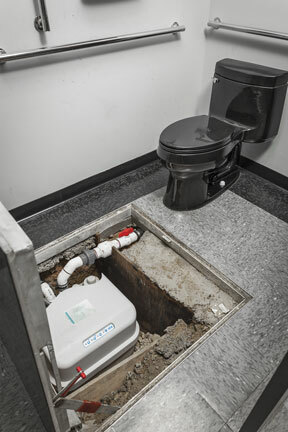 The pump was placed inside a specially made, three-foot pit in the floor near the bathroom applications, which Nichols covered with an aluminum hatch for easy access. From there, it pumps wastewater up and across a horizontal distance of roughly 40 feet to the drain line. (The unit can pump a maximum of 36 feet vertically and/or 328 feet horizontally.) Although the grinder was installed below-the-floor in this application, it can also be installed above-the-floor to avoid drilling altogether. The installation progressed without major complications, with Nichols taking extra care to make the project look professional. Completed in 2012, the duplex grinding system has given Smith no reason to complain. “It has worked phenomenally and done exactly what it’s supposed to do,” he says. In March 2017, five years after the pump’s initial installation, Smith was able to easily perform some routine maintenance, thanks to the product’s accessibility and simple assembly. 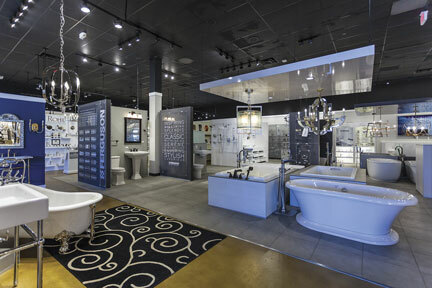 SFA SANIFLO U.S.A. – whose parent company originated macerating plumbing technology — offers a complete line of up-flush toilets and gray water pumping systems for residential and commercial applications. Saniflo developed its innovative, “above-floor plumbing” technology more than a half-century ago and has led its commercialization worldwide. Today, the company markets macerating technology through 24 subsidiaries in 50 countries and has sold more than seven million units worldwide since 1958. Saniflo markets through independent sales agents throughout North America, and the product line is currently available at distributor and dealer locations throughout the United States and Canada. For more information, contact Saniflo at 1-800-571-8191. Or visit the Saniflo website at go.saniflo.com. For editorial assistance, including photography, contact John O’Reilly or Tony Bara c/o GreenHouse Digital + PR: 815-469-9100 or john@greenhousedigitalpr.com; tony.bara@BetterPR.com. Dale Nichols of PipeTech Plumbing Technologies (left) and Nathan Smith, Ferguson Branch Manager in Raleigh, stand over the Sanicubic 2 duplex grinding system from Saniflo, which grinds and pumps effluent to the drain line. Dale Nichols of PipeTech Plumbing Technologies (right) and Nathan Smith, Ferguson Branch Manager in Raleigh, stand near one of the toilets served by the Sanicubic 2 duplex grinding system from Saniflo, which can handle wastewater from multiple fixtures. 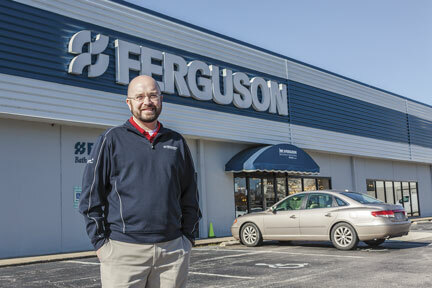 Nathan Smith, Ferguson Branch Manager in Raleigh, stands in front of his showroom. 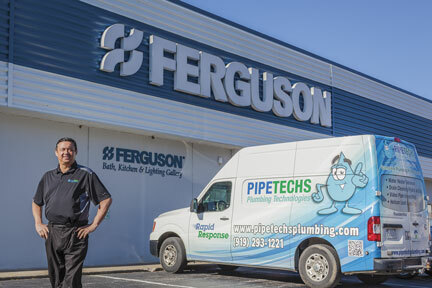 Dale Nichols of PipeTech Plumbing Technologies stands in front of the Ferguson showroom in Raleigh. The Sanicubic 2 duplex grinding system from Saniflo, installed in an underground pit at Ferguson, is equipped with two grinder pumps for handling multiple waste fixtures. The unit can pump a maximum of 36 feet vertically and/or 328 feet horizontally. View of the Ferguson showroom in Raleigh, NC.